Theo van Doesburg had just 30 subscribers for the first edition of his art, design and architecture magazine, De Stijl. Dedicated to the “the development of a new aesthetic sense” he published the inaugural copy in the Dutch city of Leiden during 1917. A century on, museums and galleries across the Netherlands are celebrating the legacy of the art and design movement that shares its name with the magazine. De Stijl — the Dutch term for ‘the style’ — has been described as “Holland’s most important contribution to twentieth century culture.” Piet Mondrian’s abstract compositions — featuring blocks of blue, red and yellow hemmed in by black lines — and furniture designed by Gerrit Rietveld count among the most widely recognised works by the movement’s founding members. 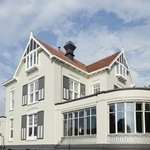 Creatives began exchanging ideas in an artists’ colony at the village of Laren, 25km south-east of Amsterdam, in 1916. At that time Indian soldiers were fighting in trenches barely 200km away on the Western Front. Mondrian had returned back to the Netherlands, from his home in Paris, to visit his sick father, when war was declared in August 1914. Rather than attempting to cross the front line to make it back to France, he decided to remain in the country of his birth, which stayed neutral during World War One. 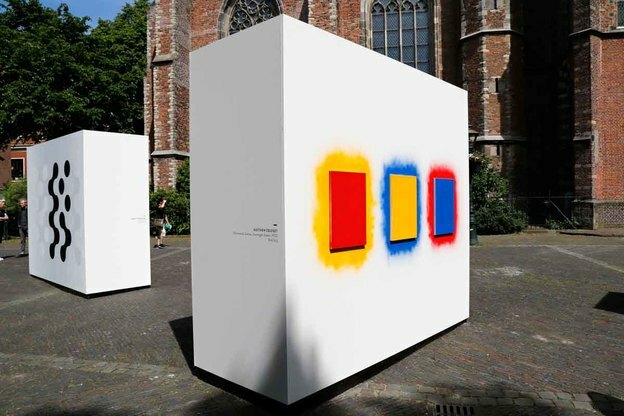 There, in Laren, he began collaborating with Bart van der Leck, a painter who already favoured the use of bold, primary colours on his palette. Van der Leck viewed Mondrian’s simplified, abstract compositions and moved in that direction. His sketch of people outside of an industrial complex in 1917 is displayed next to the stylised work that it inspired, Composition No. 3 (Leaving the Factory). Consequently, it’s possible to discern the abstractions and relate the blocks of colour to the scene depicted. Three major exhibitions have been planned at the Gemeentemuseum, in The Hague, during 2017. 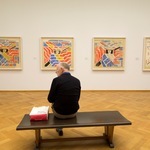 Piet Mondrian and Bart van der Leck: Inventing a new art runs showed how the two artists influenced each other. The others are The Discovery of Mondrian (3 June to 24 September) and Architecture and Interiors. The desire for Style (10 June to 17 September). The spacious museum holding those exhibitions was designed by the architect H.P. Berlage, who aligned himself with the De Stijl movement, and is regarded as his Art Deco masterpiece. Berlage also drew up the plans for the St Hubertus Hunting Lodge, close to the Kröller-Müller Museum, in Hoge Veluwe National Park, which houses a number of works by Mondrian and Van der Leck. From 20 May to 3 September it hosts Arp: The Poetry of Forms, featuring works by the sculptor Jean Arp. Like many members of De Stijl, Oud had a holistic vision of the relationship between art and design. He wrote that colour and paintings “have the power to ‘bring to life’ the planes that we, as architects, use to create emotion and to make them a vital part of the space.” Those colours and their impact will be explored at the Kunsthal KAdE Amersfoort from 6 May until 3 September, during the exhibition The Colours of De Stijl. According to their vision, buildings with bright, airy rooms and façades with clean lines would be part of modern society. Rooms with predominantly white walls and sizable windows are now the norm in many parts of the world but in 1917 dark wood furniture dominated European interiors. The concept was nothing short of revolutionary. The goal of the designers was to create a positive environment in which to live and spend time. The most celebrated example is the Rietveld Schröder House, built in Utrecht during the 1920s. It was inscribed as a UNESCO World Heritage Site in 2000. Another of Gerrit Rietveld’s buildings, the Rietveld Pavilion was built as an exhibition space in Amersfoort. Its bright interior and functionalism reflect core characteristics of De Stijl-influenced spaces. It will be restored to its original state over the months ahead and host Beyond de Stijl. Gerrit Rietveld and the 1950s from 13 September until 8 January 2018. 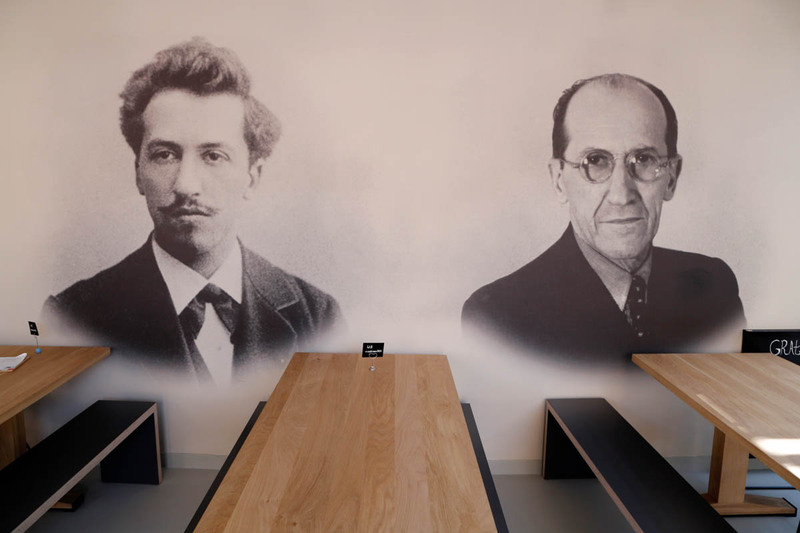 Famously, during the 1920s Piet Mondrian’s Parisian white-walled Paris studio drew a stream of admiring artists keen to view the upbeat workspace in which he painted. 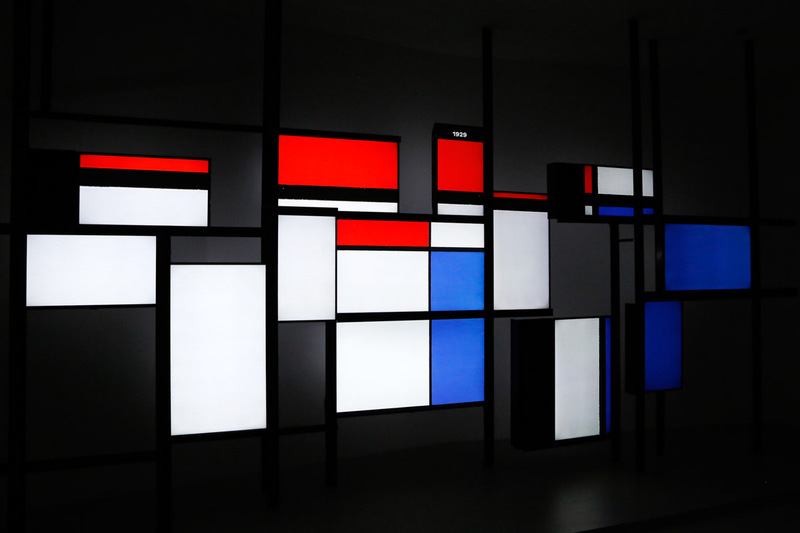 That room has been recreated at the Mondrian House, a newly renovated museum at his birthplace in Amersfoort. State-of-the-art multimedia is used to provide insights into his work. Much of the focus is on his unfinished masterpiece, Victory Boogie Woogie, which is said to depict the vibrancy of New York City, where he died in 1944. 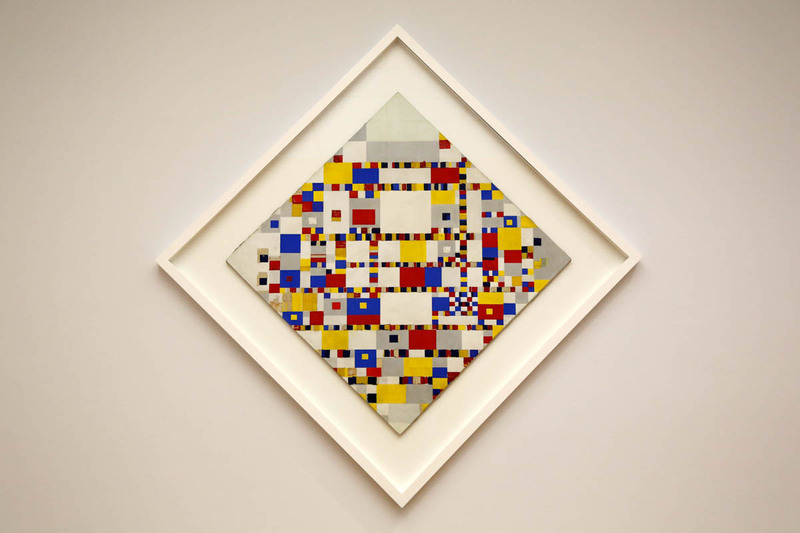 The original hangs in the Gemeentemuseum, which holds the world’s largest collection of Mondrian paintings. “In the work of Mondrian you can follow his steps and execution. The beauty of the work is that you don’t need to have an understanding of the history of Western art, an understanding of Greek mythology or an understanding of philosophy. Looking at the work, you can understand it,” said Benno Tempel, the museum’s director, at the opening of the current exhibition. Theo van Doesburg died in the Swiss town of Davos in 1931, the year that the final edition of De Stijl was published. The abstract art movement whose ideals his publication advanced flourished during the 1930s and numerous buildings were constructed embracing its principles after World War Two. Over the months ahead, exhibitions held in the Netherlands as part of Mondrian to Dutch design. 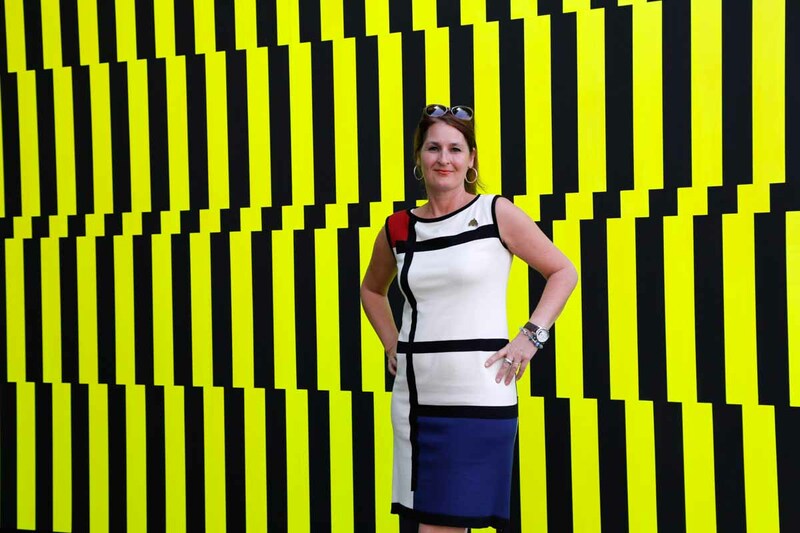 100 years of De Stijl looks set to raise awareness about the movement’s ideals and influencers. 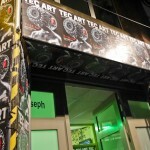 For an overview of events and activities being held during 2017 as part of Mondrian to Dutch Design see the www.mondriaantodutchdesign.com website. The Netherlands’ tourism website, has information about De Stijl plus plenty of other things to do and see in the country.